If you’ve had the chance to read our previous reviews from our builders’ tools and supplies series, then you’ll know that every month we take a close look at a different tools and equipment supplier (See Screwfix , Review). This time we’ve put Tool Station on trial, to give you an unbiased review of the company, and to compare against our criteria that includes Toolstation’s ease of use, features, costs, delivery, reviews, and then give you our unbiased conclusion. Let’s start off with the website, which looks pretty slick with useful icons to help your navigation. The search tool is very straight-forward to use and quickly retrieves your search results. The products even show the customer ratings, which can be really useful when deciding on a product. If anything, there are perhaps too many categories to choose from, as they cover a large range of products including home appliances, automotive and cleaning and pest control – which is great if you’re looking for something you may not find in your typical builder’s supplier. There are hundreds of branches across the UK, so unless you’re in a very remote location, you won’t be too far away from a branch. Online ordering is easy and if you do a lot of repeat orders, you can simply add the code of a product with Quick Trolley. 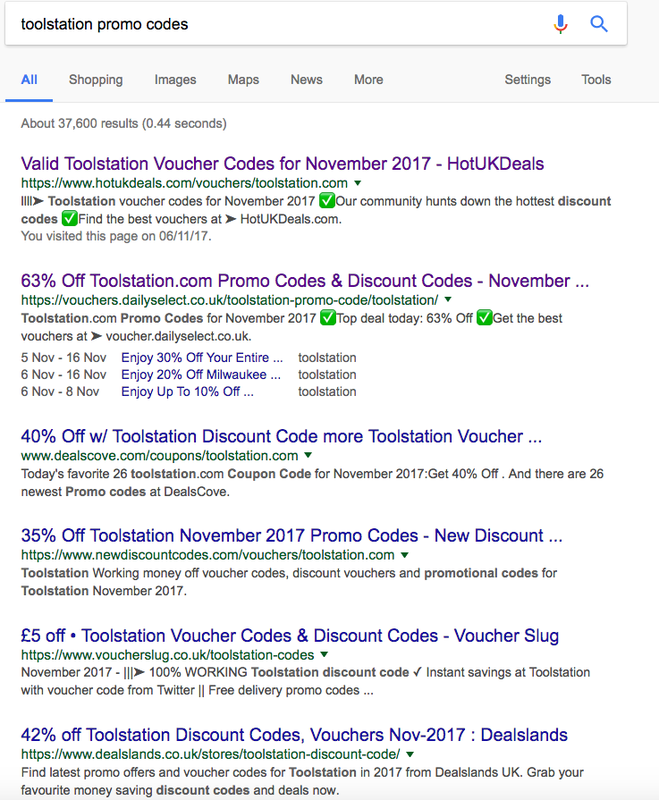 Like any big e-commerce site, Toolstation promo codes and discounts are always in demand, and there are plenty of sites out there that aim to provide. Whilst a quick search will provide numerous sites on Google, we’ve found a few to be most useful. 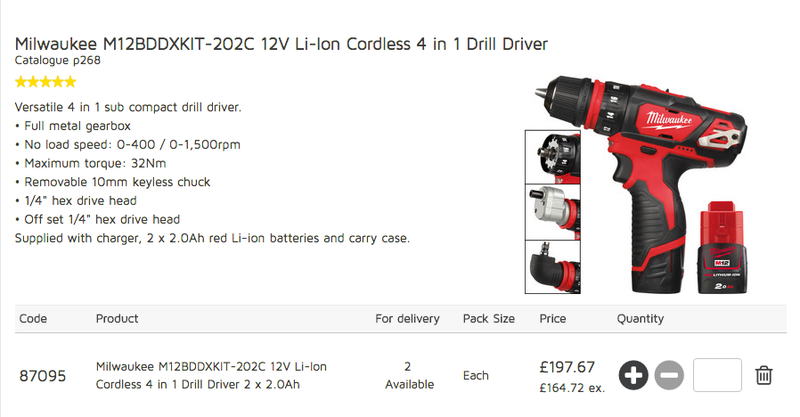 Toolstation discounts are often available on their website. One of the main promotions currently visible on their site is a discount of £5 off an order of £40, which gives you more of an incentive to order online. This is true especially if you already know what you want to order and don’t mind having your tools and equipment delivered to your address. You can get next day delivery, although if you urgently need a product to come in the morning, there is a £5 charge for that service. The contact details for the contact centre are quite difficult to find on the website but once you have found them, you’ll discover they’re available to answer your queries every day of the week. There’s a very handy little app that will allow you to place orders whilst on the go, or check stock availability. You can access your order history to make it easier to place repeat orders. Whilst the latest version of the app has been out for a few months, but it’s hard to summarise a general consensus on the app, as it currently doesn’t have enough reviews to make an informed opinion. 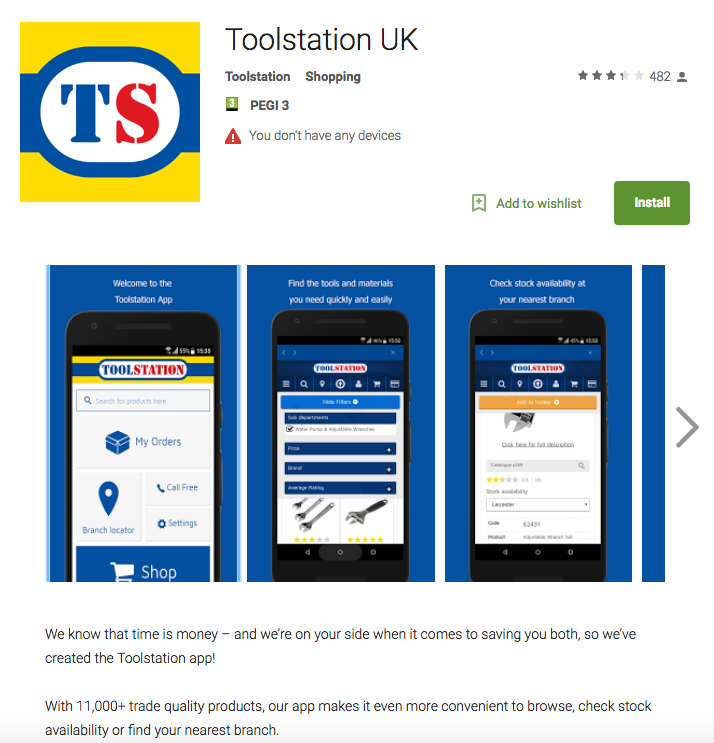 The real benefit to the Toolstation app is the all-in-one functionality, with the conventional but highly useful ability to locate the nearest branch, to contact your store, and to make orders online. The design and interface allows for a seamless experience on your smartphone, and the above average number of downloads and reviews says it all. The prices of each product are readily available on the website, and they have some good deals when compared to other businesses offering builder’s tools and supplies. As an example, you can pick up a Tajima Japanese Pull Saw blade from £14.80. You can also order a catalogue to get a better idea of the prices. Looking for bargains? Head to the Clearance section for big discounts on many products – ideal if you have flexibility on what you are looking for. We already noted that there are no reviews available for the app but what about the company itself? Top review site, Trustpilot, gives it an unbeatable 5/5 from a whopping 42,243 reviews. Do you even need to read on now that you know this information? The reviews are obviously pretty glowing apart from the odd review that cites issues with delivery. That’s a pretty stellar achievement for them! Tool Station is a fairly new addition to the builder’s tools and supplies industry, having only opened in 2003. Most competitors go back much further, but 14 years is enough to be able to say it is a well-established company. We always like to use customer reviews as an indication of a company and you’ll struggle to find a competitor with better ratings on Trustpilot. Don’t they say that the customer is always right? 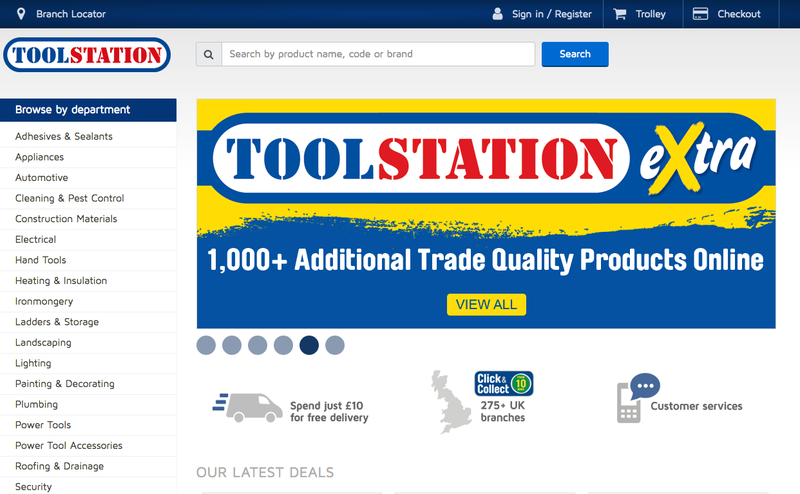 You might be able to get better trade discounts elsewhere, but for an overall assessment; Toolstation certainly passed their trial with flying colours! Tradesman Saver also provides liability insurance for tradesmen covering a wide variety of professions. For further information, please see our Tradesman Liability Insurance or Who We Cover pages. I went to Taunton (20 miles away) to buy 3 pairs of door handles. They only had 1 pair in stock and offered free delivery. They arrived next day as promised. The cost of the handles £19.47.